Believe it or not, here on the desert we have a lot of water. Irrigation canals, stock ponds, a few trout streams and if you head for the hills, alpine lakes. But finding a piece of water for the NAVHDA utility test? A tall order. It’s gotta be a good acre or more in surface area, and swimming depth. But more importantly, it’s got to have a lot of brush, reeds and other cover for a swimming duck to hide in and a searching dog to work through. The Natural Ability test required Manny to simply swim after a bumper twice. I sought, and got, permission to use a couple nearby ponds and even the puddle on BLM land held enough water most of the training season. But they reflected their desert environment (pardon the pun) in that they were sterile … no brush, no cattails, just a pristine surface. The “duck search” portion of the Utility Test requires ten minutes of aggressive work among the reeds and rushes, mainly swimming. That’s a lot of watery brush. Or brushy water. No self-respecting rancher wants that stuff in his stock tank. I’m asking around. Got a few leads. One of my training club members has a line on a marshy patch of that trout stream I mentioned. A friend has a neighbor who built a “technical pond” for retriever training … whatever that entails, I’m hoping it has brush and I’ll get invited. Google Earth might be of use identifying others. And other dog club members may be of help. I hope. Yeeha! Thanks Jim. Keep that boy in line! One piece of advice I got on the duck search that is worthy of passing along-don’t fire a blank before you send Manny out to search in case you have to resend since you won’t get a 2nd shot. Finding a sutible location to train for duck serch can be difficult in many reigions. We have to lean on contacts, friends, neighbors, etc to find acess to locations. Don’t overlook areas like commercial building landscape ponds, tree and plant nurseries, agricultural drainages, and other private properties keeping you and your dogs saftey in mind. 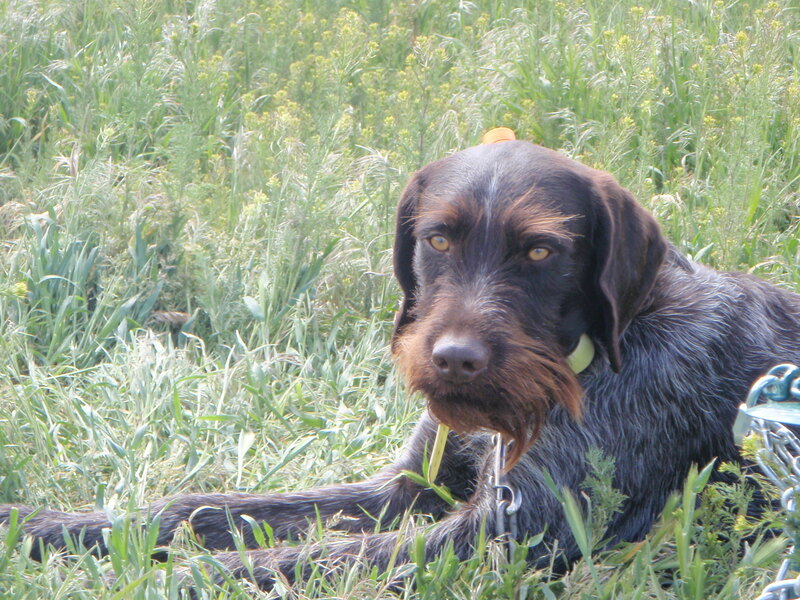 Asking permission in a respectful, and informative manner can go a long way in training your hunting companion, and in being a pisitive ambassador for the great NAVHDA orginization. Also, as locations become scarce for one reason or another, we have to learn how to adapt our training towards continued sucess. I have seen many 4 level duck search dogs trained in areas with little/ limited acess to water. The duck search is excattly that, a search for a duck. Any positive exposure you can give a dog in independently going out and sucessfuly locating duck is good. The lessons can be easily transferd to the water when available, and in many cases may help in cementing a solid field search as well. Best of luck, and happy hunting! You are spot-on, Leo. We do “duck searches” on dry land all the time. And as I said, there are neighbors who will pitch in and offer their water. Finding the good bits are a little harder, but worth the effort. The search continues!